This chapter summarizes many different conditions not summarized in other chapters. Although rare it includes several common causes of bleeding during pregnancy. These are spontaneous liver rupture, peptic ulcer bleeding which is extremely rare, and inferior epigastric artery bleeding. Bleeding from peptic ulcer and the inferior epigastric artery is commonly treated conservatively. On the contrary spontaneous liver rupture due to HELLP syndrome is a life-threatening condition with high maternal and fetal mortality. Only early recognition of underlying cause, before the rupture, or early surgical cessation of bleeding with the simultaneous Cesarean delivery of viable fetus contribute to improved maternal and fetal outcome. Additional conditions included are gastrointestinal–genital communications. In the nonpregnant population, these are rarely emergent conditions. 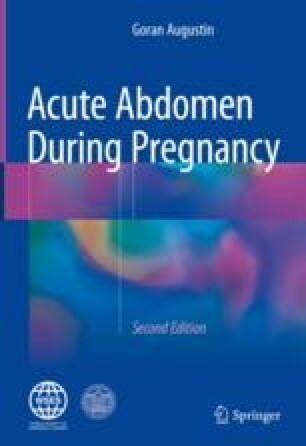 In pregnancy, due to the communication with a gravid uterus and possibility of spreading an intra-amniotic infection, such communications have deleterious consequences to the fetus. Therefore, these conditions represent true emergency during pregnancy and should be treated surgically in consultation with an obstetrician if delivery is indicated.